The Deluxe Clamshell kiln comes with special ceramic fibre lid, ensuring your chamber is kept as dust free as possible on every firing. With embedded heating elements the heat is evenly distributed directly down onto your work in the chamber. The Paragon manufactured square CS-16D digital glass clamshell kiln is super-easy to load, because the lid and the chamber itself can be lifted out of the way, allowing the artist to work directly on the chamber floor of the kiln. The 16 inch or 40cm chamber is large enough for some spectacular glass projects yet is conveniently powered by a standard domestic 13amp plug. 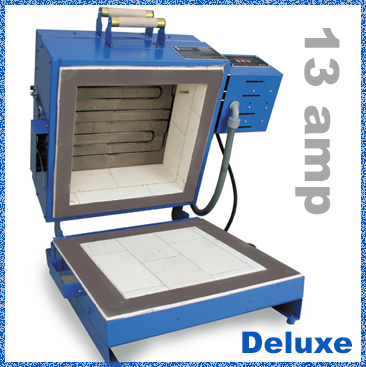 Explore the exciting world of glass fusing with this precise and reliable electric kiln. Make your own glass murals, bowls, pendants, earrings, cufflinks, and even bracelets. Control each firing to your own chosen firing rates, temperatures, holds and cooling programs. Try out whatever glass technique you wish and get the most exacting control possible. Dabble with dichroic glass. Make gifts that your friends will treasure, or create unique artwork that you can sell in your own artisan business. The Clamshell kiln stocked by Hobby Ceramicraft comes with UK 13amp plug attached and has a mercury control switch on the lid to cut the power to the heating elements when the kiln lid is lifted. The Clamshell kiln is CE approved. A cavernous 40cm wide chamber for the largest of projects yet when pulling full power uses no more electric than a large electric kettle (3kw)! One of the most significant benefits of this particular kiln is the access you are able to get to the chamber floor before and after firing by lifting either the lid or rhte lid and the chamber together. When the kiln is full simply lower the kiln over the shelf and fire, simple! The kiln is very easy to open due to the three counter-weight springs mounted underneath the kiln. The base of the kiln extends 10cm in the rear to support the weight of the kiln when in the open position. The base is attached to the bottom of the kiln and comes with rubber feet. The CS-16D can be opened by lifting the kiln body or the kiln lid, but never both at the same time. The kiln is equipped with safety latches on the side. The gravity operated top latch holds the lid closed; the lever-operated bottom latch holds the kiln body closed. The top of the fibre lid is protected with a painted sheetmetal cover. The sheetmetal is bent to cover the sides of the lid and then carefully welded at the corners. The self adjusting lid floats as it expands during each firing. The CS-16D is sold with a two year warranty. The temperature sensor, called a thermocouple, is protected with a high-nickel stainless steel cover for long life. A heavy steel base supports the reversible brick bottom completely. No extra stand is needed. Inside you will find dual mechanical relays for long life. The digital controller sends a signal to the relays to turn on the heating elements. Having two relays in the CS-16D ensures a longer life than the single relay of other kilns because of the reduced amperage going through each relay. For your convenience, flip the switch on the front panel to turn off power to the controller when the kiln is not in use. The large, comfortable wooden lid and kiln handles stay cool. You will be amazed at the simplicity and convenience of digital firing. The advanced Sentry Xpress computer continually monitors each firing so you do not need to closely watch the kiln. (Please remember, however, to check the kiln occasionally during firing and to monitor it near the expected shut off time.) A computer which controls with exacting precision, yet is easy to program. *Program up to 8 segments (steps) in Ramp-Hold mode. *Fire to a single temperature at a single speed in Single Speed mode. *Store up to 4 programs in Ramp-Hold mode. *Change the target temperature in Ramp-Hold during firing without stopping the kiln to reprogram. *Time during firing without having to stop the firing to reprogram. *Easily control both heating and cooling in Ramp-Hold. *Program Review lets you check the program you are about to fire. *Program the Temperature Alarm to sound when the kiln reaches a specific temperature. *Program an alarm that will remind you to check on the kiln. *Thermocouple Offset adjusts the thermocouple readout. *Set the delay to turn on the kiln at a time that best suits your busy schedule. *Error Messages report mechanical problems. *The sealed touch pad keeps out dust and is easy to wipe clean. *LED Lights show whether you are in program, review, or firing mode. Glass must always be fired on a ceramic shelf never directly on the kiln firing chamber floor.